Family Men Don't Wear Name Brands: What Happened to Halloween? Halloween used to be scary. A friend of mine had a really scary looking skeleton figurine on display in his home for Halloween. The detail on the monster was fantastic, something that you might see in a gruesome horror movie or outside of your home on a dark night, waiting to kill you. I pressed a button on the base of the figurine and waited to witness it’s audio-animatronic terror. Isn’t Halloween supposed to be scary? Shouldn’t that figurine moan and groan, jump off the platform and try to eat people? More and more trick-or-treaters these days dress up as U.S. presidents, TV celebrities and other non-scary individuals -- though some presidents and TV celebrities are pretty darn scary. What happened to being a werewolf, a vampire or Frankenstein’s monster -- a creature that’s bloodcurdling and dangerous? Even dressing up as a crash victim would be an acceptable choice for a Halloween costume. At least there’s blood and guts. If that’s not bad enough, people have made “The Monster Mash” the soundtrack of Halloween. How does a song like “The Monster Mash,” which belongs on “Sesame Street,” become the anthem for what’s supposed to be the scariest time of year, when ghosts and goblins and ghouls come out to get you? When I was a kid, I wanted to be scared on Halloween. I wanted to see scary images. Come the first of October, I would hang decorations of witches, ghosts and monsters in my bedroom so that at night, with the help of my imagination, those monsters would come to life and frighten me so much that I wouldn’t be able to sleep for three months. How are the ghost and monster decorations of today with their smiley faces going to do that to me? I’m sure to sleep like a baby. These days, kids don’t even go trick-or-treating on the streets. They go to community centers and shopping malls to collect candy. What fun is that? Monsters don’t hang out in brightly lit community centers or in over-crowded shopping malls looking to maim and kill. Monsters hide in dark houses in strange neighborhoods, and in bushes and behind trees, waiting to jump out and brutally attack trick-or-treaters who are caught off guard. People have told me that they prefer to have their kids go to community centers and malls for Halloween parties or trick-or-treating because they don’t want their kids collecting “poisoned candy” from strangers. Heck, I’ve been to some restaurants where you take more of a risk. 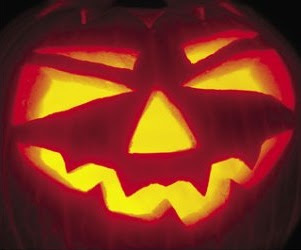 So maybe trick-or-treating in shopping malls is safer than trick-or-treating on the streets. As a young trick-or-treater, I always preferred danger. That’s what Halloween was -- and should be -- all all about. Right? And then you become a parent and you don’t even allow your kids to talk to strangers, let alone permit them to go up to a stranger’s dark porch at night and ask for candy. My 3-year-old son has nightmares about Elmo, the red puppet that makes most kids laugh. My wife and I have to stay up all night comforting him. I’m not going to introduce a slimy, bloody zombie to my son’s imagination. I like sleep. And I have no problem buying happy-faced Halloween decorations for our home, or a skeleton figurine that sings and dances to “Bad to the Bone” instead of one that moans and groans and threatens your life.